"Instead of fixating on your next vacation, maybe you should set up a life you don't need to escape from" Seth Godin. It’s always clearer in retrospect, there was no grand plan, but looking back I can divide my life into two phases. I was a dissatisfied guy doing engineering contracts in the aircraft for about 15 years. I fell into it and it helped me to fund budget travel. Having a job I didn’t particularly like meant I had real motivation to leave and when the job was over I would take the backpack and go. Then came this thing called the internet happened, I remember in the 90’s people started to use it for business and I started to hear anecdotes of people making money. I never saw it as much of an opportunity for me, I never saw myself as a business guy, I saw myself more as a writer. There is a lesson there that your self-image can really drive your motivation and your life on a real level. I don’t regret viewing myself as a writer, but that was just where I was until about 2005. With the advent of word press and Search Engine Optimisation (SEO) I started to see that maybe the internet a way that I didn’t have to keep coming back to these jobs that I didn’t like all the time and working 80 hours a week. It was organic interest, it seemed like a challenge. I’d build niche sites, get traffic, and through google AdSense and a few affiliate links and the money starts coming in, and it’s not very much but you realise not only can you have an effect on the google search results pages but you can also actually get a click and make money. I was coming to Asia a lot, life is cheap here, I met my wife in 2003 and in 2005 we bought a place here in Bali and basically I realised instead on needing five or six thousand dollars a month to live in Seattle or California, you can live quite well for one thousand dollars a month. It’s a good quality of life and regardless of how much money you have its good value. For me I could see then that solely from google AdSense I was in striking distance by 2008 to make enough to live here and not have to go back to work. That for me was life changing. What’s a thousand bucks a month? Well in the US or Australia it's nothing but for me it wasn’t about the money it was about changing my life which was a big deal. I never wanted to go back to selling my time for money and I finally had a way out of it and I seized it. To be very honest with you it wasn’t actually that hard once I saw the opportunity in front and I just went forward. So here we are, now I’ve done many different things in internet marketing broadly, SEO, paid traffic, content marketing etc. Wage freedom started out as a passion project and not really commercial at all, but I realised that overtime as the world changes and not everybody recovers from the recession we had in 2008/2009, there is a real need for people to hear that they are not restrained or constrained to the cubicle or the barista station. I started wage freedom when I was still working, which I think is important to do. For clients, I always suggest this. I made a plan and bought a big site and ended up making several dozen niche sites. It initially started out as a place for me to write about themes in my life and pursue this idea of breaking free. Because I did it basically after each contract I had. A lot of my digital nomad friends broke away once on a tangent of which they were not coming back. I applaud that, but that was not my path. I became very familiar, with breaking free and had to reaffirm myself with every job why I was doing it. It wasn’t to go to the mall on the weekend, it was to go and see India, the Greek islands etc. To free yourself, it doesn’t happen when you go to buy the airplane ticket to go somewhere, even to walk into your bosses office to quit that job. The victory happens well before that, it happens when you are still in the cubicle. When you are having to constantly re-affirm to yourself that, yes you are dissatisfied but you will make this into a good situation and will have to change it, possibly radically. Coming to Bali is not the answer for everybody, even travel is not the answer, but whatever the next natural step in your life is for you, you are going to have face that dissatisfaction, there’s a good chance it’s not going to go away especially if you have felt it for years and years. Improving your life requires a level of focus to break out of it. Wage freedom started out as a completely non-commercial site, I wanted to clearly define these themes for myself. What has happened overtime is people have connected with a lot of these themes. Even though I living here in Bali I look like I have made the leap, the themes are still very much alive in my life. I don’t regard Wage freedom as particularly commercial even now, my passion and focus is the mindset which we all need to breakthrough, it’s a constant challenge in our lives and a challenge that changes overtime. That’s what I continue to be interested in and that’s what Wage freedom is about. The one that has really worked for me is writing every single day. Writing can be constructive, it can be therapeutic for me it helps to focus me, it’s almost like an affirmation. If I spend 20 minutes writing out here’s where I am, why I’m doing it, better ways I could do it or what I shouldn’t do and things like that. In the pursuit of clarity and focus writing is really what does it for me and sets me on the path for the rest of the day. In the age of twitter and all the rest of it seems more important than ever. The thing that enriches our lives is also the thing that distracts us profoundly. You need to have a process where you can grab some mind space or attention for yourself. I think of it as attention autonomy where you need to overtly takes steps to grab this focus for you and writing again makes things stickier and helps me keep things top of mind. If I don’t do this daily and make it a point to do every day, it’s just too easy for your focus to unravel in my experience which is an extremely high place to play and is unacceptable if you are trying to accomplish something every day. When we are employees and we get our butts in the chair everyday theoretically we are going to get paid and everything is going to be OK, if you are trying to be an entrepreneur you have to have a different mindset and you cannot accept having your attention and intent unravel. Intent follows attention and focus and if that intent unravels then you are lost, not just for today, these are unacceptable setbacks. This concept of distraction is a big theme in my life now as it is for a lot of people. We must develop a new muscle where can switch everything off. We must be able to filter what is worthy and what is not because the future will not bring less, it will bring more, so each of us needs to develop this muscle to filter the good from the bad. Pushing this to the future, all these enriching distractions are seductive today , but within about two years or less with virtual reality and augmented reality we are going to go from seduction to immersion. So what happens if you don’t today start to develop your ability to grab your focus to grab your attention back to get a baseline level of consciousness of yourself. You need to find a way to embrace it but maintain your agenda. In keeping with the themes of wage freedom a favourite person of mine is Seth Godin. “Instead of fixating on your next vacation maybe you should set up a life that you don’t need to escape from”. An author that I have enjoyed a lot in the last few years, has a great blog, a very funny guy and a wise man. 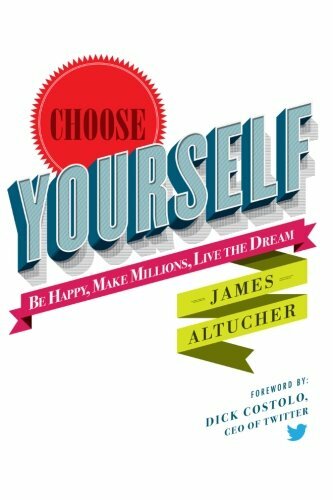 James Altucher, Choose Yourself. It’s never been more possible to pick a direction that you may have zero experience in but you have this sincere interest in and move towards it, whether that’s writing that book you’ve always had in your head all of your life or some new way to make money, build an app, whatever it might be for you. The basic idea is thinking of yourself as having more agency than you ever did. The tools are available and out there to learn. You don’t need any OK or approval from a third party to move towards your dreams. You can choose yourself, don’t wait, don’t kid yourself, you have more agency and freedom than you may realise, don’t hide from it.